The mobility of the future also poses new challenges for the logistics industry. The transport modes of water, rail, and road are becoming increasingly networked. The resource efficiency of logistics is to be raised by means of improved freight management and transport routing. Saxony-Anhalt is at the forefront of making freight transport more time and resource-efficient, and is developing solutions in the field of supply chain and transport management. The Deutsche Bahn’s new train formation depot in Halle is the most modern of its kind in Europe. Starting from here, freight trains set off for south-eastern Europe and travel as far afield as China. In the south of Saxony-Anhalt, one of the largest marshalling yards in Germany has recently opened following an investment of 180 million Euros by the DB and the German federal government. The result is one of the most important cargo hubs in Germany and the most modern depots of its kind in Europe, where up to 2,400 freight wagons can be assembled into long trains per day – on an almost completely automated basis. A new era for rail freight transport in Central Germany has begun in Saxony-Anhalt: at the end of June 2018, the Deutsche Bahn (DB) officially opened the Halle-Nord train formation depot (ZBA). The reconstruction and expansion of the former marshalling yard of the city of Halle took four and a half years. With its modernisation, the city in southern Saxony-Anhalt is now one of the biggest freight hubs in Germany. Here in Saxony-Anhalt, the DB isn’t just centralising the freight traffic in Central Germany, it is also replacing the outdated infrastructure in many places on the rail network. All in all, 180 million Euros were invested in the project by the DB and the German federal government. The train formation depot is located in the immediate vicinity of the central station of Halle (Saale) in the heart of the city. Its dimensions are huge. More than 42 kilometres of track with 133 points and a total of 75,000 sleepers were laid on the 260,000 square metre site, in addition to almost 10,000 tonnes of steel. With its new facility, Saxony-Anhalt is home to the most modern train formation depots in Europe. The process of assembling the trains at the depot is almost completely automated. Even the shunting locomotives at the Halle-Nord ZBA, which move the arriving freight cars onto the hump, are unmanned, and controlled by the central computer system. The same applies to the wagons: a pillar situated on the track scans the waybill on each wagon, which contains information about its origin, destination, load, weight and speed. The data is transmitted to the electronic signal box, and the process control computer directs it from the hump over several points and onto one of the 36 sorting tracks. There, the wagons are put together to form new trains which can have a length of up to 650 metres. This kind of bundled transport is both efficient and environmentally-friendly. The process control computer also regulates the speed of the rolling cargo – if the wagons are too fast, they are slowed down with automatic braking systems which have been installed in the track bed. If their momentum is insufficient, they are pulled by yellow locomotives to the finish. The newly created trains then leave Halle on two exit tracks. Since its opening, 22 trains have been put together at the depot every day, and after the timetable change in December, up to 2,400 freight wagons are set to be sorted per day – or 120 per hour! Night work is indispensable for this goal to be achieved, resulting in another area in which Halle has broken new ground: for the first time ever, LED lamps are illuminating a train formation depot. 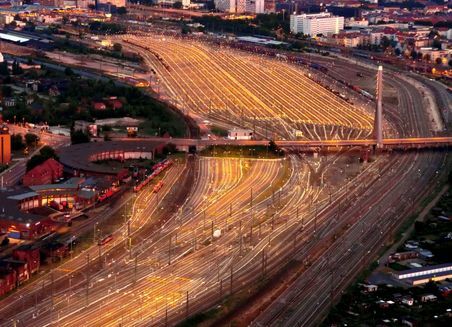 653 light masts, 14 metres high, with a total of 1,130 lamps illuminate the maze of tracks in the dark and fulfil the elevated requirements of the German Federal Railway Authority, which require the lanes adjacent to the tracks and between the wagons to have a brightness level of ten lux. It was in 2006 that DB Cargo, a company of the Deutsche Bahn with responsibility for rail freight transport, reorganised its area of business. Its new plans envisaged the use of nine large train formation depots; there were already eight in Germany, with one lacking in the south-eastern region. The decision was taken in favour of Halle (Saale). Of decisive importance for the investment was the location of the city in the European route network, says Eckart Fricke, Representative of Deutsche Bahn for Saxony, Saxony-Anhalt and Thuringia. The decision in favour of the Halle location was also taken on the basis of the current plans of the DB to construct and extend a third important north-south route through Germany in addition to the two existing routes in western Germany in response to growing traffic flows in Europe: the Eastern Corridor from the northern ports - Stendal - Magdeburg - Halle - Leipzig - Hof - Czech Republic / Munich / Austria. Halle is now the logistics centre for the DB in Central Germany. It is from here that flows of goods make their way to south-eastern Europe. The freight also travels north to Magdeburg or Berlin and south to Leipzig or Erfurt, where it can then advance to other cities in Europe and the world. Halle is set to become the central distribution point for goods that travel to the Far East and as far afield as China. The city on the river Saale therefore finds itself on the New Silk Road, the infrastructure project of the Chinese government which aims to revive the 500-year-old trade route, connecting Asia, Europe and Africa. Above all else, Halle is to serve as a transhipment point between the seaports and Eastern and Southern Europe. To achieve this, the DB is upgrading the corresponding freight route known as the Eastern Corridor, the line from Uelzen (Lower Saxony) via Stendal, Halle and Leipzig to Bavaria and on to Southern and Eastern Europe. Halle is therefore becoming the central freight transport hub in eastern Germany. In the Halle region, key rail routes intersect in the north-south and east-west directions. In the future, DB Cargo intends to bundle the production sequences for single wagon goods transport for Central Germany at the new train formation depot, thereby further reducing the transport times for the customers. "Saxony-Anhalt has both a great past and a great future as a trading hub. The new train formation depot opens up new possibilities in national and international freight transport. This modern marshalling yard is a boost for the whole of Central Germany, providing an important economic impulse and securing jobs throughout our region," highlighted Thomas Webel, Minister for Regional Development and Transport in Saxony-Anhalt, at the opening of the depot in June. The construction of the new train formation depot forms part of the modernisation of the Halle (Saale) transport interchange as well as the "German Unity Transport Project 8". With the upgrading and reconstruction of its rail hub, the city of Halle is therefore set to be well prepared for the new high-performance network of the Deutsche Bahn. Leipzig/Halle International Airport, situated on the border between the eastern German federal states of Saxony-Anhalt and Saxony, has developed into one of the leading freight hubs in Europe. It convinces with its 24/7 operations for freight flights, its direct connections to the trans-European road and rail networks, its space- and capacity reserves, as well as the comprehensive logistics services it offers from one single source. In 2017, Europe's fifth-biggest freight hub registered approximately 1.14 million tonnes of air freight, an increase of 8.2% compared with the previous year, a volume which has increased more than eightfold in the last ten years. Leipzig/Halle Airport is therefore the second biggest airport for freight in Germany – and it is continuing to grow. "LEJ" operates as a modern and efficient gateway for the region of Central Germany – and for the global business and tourism markets. It is at night that the European Air Hub of the postal freight subsidiary DHL – situated at Leipzig/Halle Airport – comes alive. On working days, over 60 DHL Express aircraft land at the airport at regular intervals. The freight aircraft are unloaded on the apron and their contents move to the adjacent airport sorting centre, where the conveyor belts hum over several levels and the parcels race through the hall; here, they are sorted on fully automatic basis before being packaged into other containers which are then reloaded onto the aircraft that are waiting outside. The system is able to process some 150,000 shipments per hour. Freight items weighing up to 170 kilograms can be handled fully automatically on the conveyor belts. 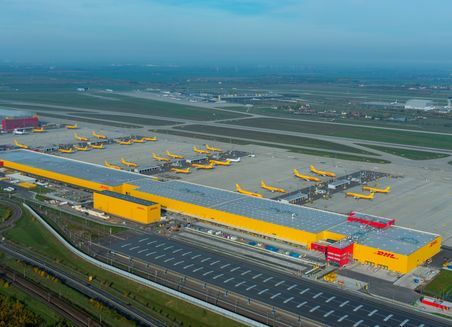 DHL has been operating its European Hub at Leipzig/Halle Airport for ten years. It is now the global player’s most important location in the world. DHL Express has invested a total of 655 million Euros in the airport and currently has more than 4,900 employees. With its European Air Hub, in 2017, the volume of freight handled at Leipzig/Halle Airport increased for the thirteenth consecutive year to reach more than 1.1 million tonnes. The Central German airport, which nestles on the border of the two federal states of Saxony-Anhalt and Saxony and has the international airport code "LEJ", is therefore the second biggest freight airport in Germany and among the top five in Europe – and is continuing to expand. "With an increase of more than eight percent, our air freight volume recorded the biggest rate of expansion among the major German freight airports. Our growth has been boosted by our express freight business in particular, and our freight and special charter business is also developing at an exceptionally rapid rate," explains Johannes Jähn, Spokesman of the Executive Board of the company Mitteldeutsche Flughafen AG and Managing Director of Leipzig/Halle Airport. The airport is Central Germany’s gateway for the worldwide markets. The freight traffic is flown to more than 200 airports, including destinations such as Hong Kong, Singapore, Seoul, Delhi, Los Angeles, New York and Cincinnati. In addition to DHL, more than 60 freight airlines use Leipzig/Halle Airport. The primary focus is on the Chinese market. The present schedule of flights includes six connections to China per week. The airport also cooperates with a variety of partner airports in China, such as the Shenzhen Airport Group, the Shanghai Airport Authority and the Chinese Henan Province Airport Group. Leipzig/Halle Airport GmbH is a subsidiary company of Mitteldeutsche Flughafen AG. The federal state of Saxony-Anhalt is its second largest shareholder. Opened in 1927, Leipzig/Halle Airport is one of the oldest airports in Germany. It is only since 1990, however, that decisive efforts have been made – particularly by the two federal states of Saxony and Saxony-Anhalt – to make the airport in the heart of Europe into one of the most modern airports in Europe. Today, it is a mainstay of the local economy, with more than 8,600 people working at over 100 companies and public authorities that are located at the airport. And there are many reasons for the success of Leipzig/Halle as a freight airport. An important factor is the airport’s 24-hour operating permit for air freight traffic, which has allowed logistics companies and airlines to operate flexibly as part of the global market. Also of importance are the airport’s location in the heart of Europe, its excellent infrastructure and its exemplary combination of rail, road and air links. In this respect, Leipzig/Halle Airport has its own railway station for the handling of air freight. The trains operate every day, and have connected the region with ports such as Bremerhaven and Hamburg since 2016. The volume of rail freight handled exceeded 160,000 tonnes in the first year alone. The passenger and freight facilities are also connected directly with the trans-European road and rail networks. Leipzig/Halle Airport is expanding its infrastructure and services all the time. Since last year, for example, the airport and its sister company PortGround have been operating a cold storage facility which is capable of handling full aircraft cargoes of temperature-sensitive goods. The extended range of logistics services on offer at the airport is aimed at companies operating in the pharmaceutical, food and semiconductor industries in Germany and Eastern Europe in particular. The airport in Central Germany has also made a leading international name for itself in niche segments, such as the handling of oversized air freight and chartered freight traffic, which plays a particularly important role, as well as the transport of large animals. In this respect, planes carrying up to 165 cattle take off from the airport on a regular basis, and the airport is also home to an Animal Export Centre. Moreover, there are few other airports at which the “Antonov 225”, the biggest aircraft in the world, has made so made appearances. This giant-sized aeroplane has “swallowed up” cargoes of freight weighing up to 160 tonnes, before taking off from the airport, more than 20 times. The everyday picture at the airport also includes the Antonov 124, operated by Volga-Dnepr and Antonov Airlines. The Antonov 124 is the biggest series-production freight aircraft in the world and has been making regular visits since 2006. In April, the German federal government announced its intention to extend the landing rights for freight aircraft at the airport. The airport is also set to receive general designation as a landing point in international aviation agreements. This would make the "LEJ" the number one airport for freight traffic in the whole of Germany. Airport Director Johannes Jähn is looking forward to this development and to welcoming more freight aircraft. "Leipzig/Halle Airport has a big advantage compared with all of its competitors: we’ve got plenty of space in which to expand and develop,” he says. And that is a major competitive advantage. Almost everybody has seen it on television, in reports: The relocation of houses, because villages have to be evacuated, or the placing of the famous 670 m long Waldschlösschen Bridge in Dresden. An imposing structure, which is to be pushed over a flowing river and the meadows of the Elbe, at one of the widest points. Projects like this come from the team of Mammoet Deutschland GmbH, Leuna. A team of engineers and experts in different trades, sometimes including up to 30 people, plans, measures, calculates and solves this special challenge. 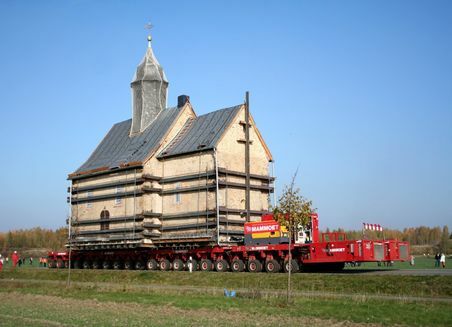 For example, the Leuna site has relocated the medieval fortified church, the Emmaus Church, with a weight of 800 tonnes, from Heuersdorf to Borna. The deep well of MIBRAG mbH was also dug by Mammoet, which also set a tipped-over giant excavator upright again in the surface mine. One of the most internationally important projects is the installation of the steel protective cover around the atomic reactor at Chernobyl. The new cover made of steel comprises a surface area of 250 metres and a height of 100 metres. Under this there would be space for Notre Dame in Paris or St. Paul’s Cathedral in London. A large team of engineers, fitters, and crane drivers was occupied with just the concept for the realisation and assembly of the cover. An interaction of theory and practice constantly yields new developments and innovations for meeting the requirements of clients cost-effectively. The employees receive special training for coping with the exceptional challenges that they face every day. This guarantees the effective and efficient transferral of knowledge. In order to also transfer some ideas arising through daily business into everyday work, as innovations, Jens Krawczynski cultivates collaborations with many research sites, especially in Saxony-Anhalt; these include Merseburg University of Applied Sciences, and Otto von Guericke University in Magdeburg, but also the Technical University in Freiburg. “For us it is important that the research and development institutions remain present at the business locations and at nodes such as the chemical site. Only in this way can the knowledge transfer between business and science be ensured and our skilled personnel be retained, such as the necessary engineers at our location.”, said the Managing Director of Mammoet Deutschland GmbH with a view to his vision for the site. “Technical practical knowledge and the technical research of the universities are to be combined in order, together, to continue to establish Saxony-Anhalt as an innovative and internationally recognised investment site.” added Krawczynski. Mammoet Deutschland GmbH in Leuna is focussing upon the leading market of chemicals, but global themes such as CO² reduction and demographic change are playing an increasingly important role. In future we will be continuing to focus upon the chemicals sector and upon the nuclear sector; the demolition of power stations is an important subject for the company. Since 2016, representatives from politics, the chemical industry and research from seven countries have been working together in the "ChemMultimodal" project to shift chemical goods from road to intermodal transport. Today, many businesses have to contend with very short-term delivery dates. Ordering an HGV to pick up the products and drive directly to the customer is often the simplest and fastest solution. For multimodal transport however, different connections have to be found and the various transport options with logistics service providers have to be discussed. In many businesses, there is little strategic planning and/or few long-term supply chain concepts that consider all modes of transport. In many cases, sales departments decide the transport connections, or those responsible for the decision-making are located in another country – or even a different continent. Under these conditions, organising multimodal transports is very difficult. As a general rule, it is also necessary to take longer transport times in comparison with road haulage into account. Punctuality and reliability are also crucial requirements for businesses. If more Combined Transport (CT) operations are to be generally achieved, the capacity levels for freight transport on the railways will also have increased over the next few years against the backdrop of the recent difficulties (the problems experienced on the line at Rastatt, the autumn storms), not to mention the current bottlenecks on the networks. In addition, the various technical standards and social parameters in the area of cross-border traffic need to be harmonised. Despite these disadvantages however, multimodal transport offers many advantages and considerable potential. It allows for the transport of large volumes, which is particularly important for chemical businesses – and from the perspective of many businesses, this is an area in which road haulage has reached its natural limits. Traffic jams and, above all else, a lack of drivers are also considered acute problems, with no improvement seeming to be on the horizon. At the chemical parks, it is also easier to load trains and wagons in coordination with the production processes 24 hours a day, including weekends. The internal optimisation of the logistics processes within the chemical parks, including the pre-loading and intermediate storage, can contribute to a superior distribution of the logistics work and help reduce the need for stationary storage capacities. For the transporting of hazardous goods, the increased safety offered by multimodal transport is also considered a clear advantage for customers who do not benefit from a direct rail link. Multimodal transport certainly has its strengths, especially over long distances. In technical terms, this is frequently referred to as the minimum total distance of 300 kilometres, which, in practical terms, is considered short. Moreover, a terminal is ideally located no more than 50 kilometres away from the place of loading or delivery. There are therefore a large number of CT transit points and general links throughout Europe. This is an important prerequisite that allows companies to transport their products with flexibility according to the requirements of their customers. The logistics service providers face the challenge of bundling a variety of transports and organising the return of the containers on an efficient basis. If the aforementioned conditions described are fulfilled, multimodal transport is also competitively priced compared with road haulage. Moreover, in addition to its economic benefits, its impact on the environment is also important. On average, multimodal traffic leads to emissions of just 26 grams of carbon dioxide per tonne-kilometre, while for road haulage by HGV, the total is 62 grams. In terms of the global and national climate policy goals, this contribution should also be highlighted. It is before this backdrop that a major European partnership has been created between Germany, Poland, the Czech Republic, Hungary, Austria, Italy and Slovakia which, in the form of the "ChemMultimodal" project, is making determined efforts to initiate and achieve the transfer of chemical goods from the roads to the railways. Upgrades to CT terminals are now under way in all of the participating countries. In Central Germany, the terminals in Schkopau, Leipzig-Wahren and Schwarzheide have seen a considerable expansion in their capacity in recent years, with more upgrades currently planned. Chemical parks such as Leuna have also invested heavily in their logistics infrastructure (rail links, storage capacity). This shows that the market for multimodal transport is generally developing on a positive basis. The key activity of the project is the implementation of pilot projects in each participating country. In this respect, the project partners work directly with chemical companies and logistics service providers. In several pilot workshops, a platform for communication and cooperation has been established, where the requirements for multimodal chemical transport and the possible transport routes have been discussed in detail, and the terminal operators and providers of logistics services have been able to present their current and planned efforts regarding multimodal transport. Businesses have expressed their interest in specific routes and volumes that are currently transported by road but have the potential for moving over to the railways. The workshops have been accompanied by presentations on the development of the transport infrastructure and the public support grants which are available. Following these events, the project partners have held bilateral discussions with interested businesses to discuss their current situation and specific supply chain requirements. At this “micro level”, it is easier for companies to talk openly about individual transport links, volumes and products. With the help of a variety of planning tools, it is possible to research possible multimodal links. In this respect, the "Intermodal Links" platform has proven to be very helpful. This platform integrates the multimodal links of 150 Intermodal service providers with some 25,000 weekly connections from 1,000 terminals. Entering the start and end destination displays a variety of multimodal transport options with the corresponding pre-carriage and post-carriage. It provides information on the terminals involved and the frequency of the connections. The information is also highly relevant and very comprehensive. In many cases, queries using the “Intermodal links” platform have enabled transport options to be found that were previously unknown to the businesses involved. Following the discussions, the project partners discuss the recommendations on the transfer of their transport operations and – if necessary – arrange for personal contacts with the logistics service providers. This provides businesses with the opportunity to obtain a definitive offer. The businesses are 100% responsible for the negotiation and implementation phase, however. With the help of a carbon dioxide calculator which has also been developed in the scope of the "ChemMultimodal" project, the respective savings in greenhouse gas emissions can also be calculated quickly and easily for the transfer which is initiated by the business in question. The "ChemMultimodal" project partners have worked together with more than 40 chemical companies during the pilot projects and initiated specific transfers. At the most recent pilot workshop in Central Germany, providers of logistics services and CT terminals presented the launch of several new transport links. Since the end of 2017, a new block train has been operating twice a week from Schkopau KTSK terminal via the CTHS terminal in Halle (Saale) to the port of Rostock. The link is being operated in the form of a cooperation between Deucon, Stena Lines and the Pressbahn rail company. From Rostock, the Baltic region is easily accessible via short-sea connections. In addition, since December, trains from the Belgian Lineas rail service have been making the trip from Schkopau to Antwerp three times a week. The train departs at 9:30 am and reaches its destination at 11:00 am the next day. This fast connection is especially important for the superior networking of the chemical regions in Central Germany and the Port of Antwerp in Belgium, between which a considerable number of supply relationships exist. A multimodal link with a business from Central Germany has even been identified that extends as far as Bristol in Great Britain: starting from Schkopau, the Lineas train travels to Antwerp. Its journey then continues over the canal via short sea, before continuing by train to its ultimate destination. The multimodal transport takes three days, which isn’t much longer than the journey would take by HGV. Furthermore, since the start of the year, the DUSS terminal in Leipzig-Wahren has been operating six connections to Neuss per week. Hupac, meanwhile, has plans for the other direction: the Bertschi terminal in Schwarzheide is being upgraded as a "gateway to the east", with new connections to Iran and India having already been announced for this year. More multimodal links to Russia, China, South Korea and Vietnam are also going to be developed. In Austria, a potential multimodal transfer has been identified that travels all the way to Turkey. In this respect, a potential CT connection runs via the terminals in Wels, Linz and Vienna, with road, rail and short sea connections all used. Alternatively, multimodal transport operations via Vienna or Sopron (Hungary) can be completed by road and rail. The transportation time for both options is five days. Chemical companies from Slovakia have used the findings from the project to carry out the loading of tank containers right on their doorstep in Duslo Šala. This option can also be used by other companies in the Czech and Slovak chemical industries to strengthen their multimodal transport. Regular container transport operations are now under way from Slovakia and Vienna to the Benelux countries, Germany and England, while regular transport operations to France and Spain are currently being organised. In the future, the new terminal in Žilina is also to be served. The terminal in Dobra on the Slovak-Ukrainian border is used for transport operations from China to Central and Western Europe. 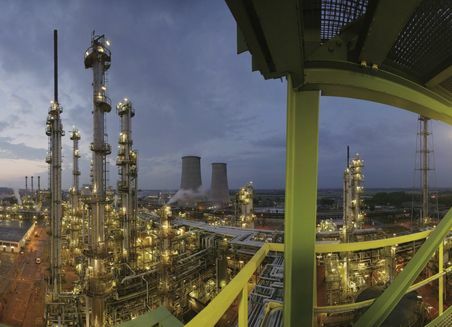 Supported by the ChemMultimodal pilot project, three chemical companies in the Czech Republic (Unipetrol RPA, Spolchemie and Vodnísklo) were able to achieve a growth in their multimodal transport operations of more than 15 percent in 2017. The added value of the project consists of improved communications and the creation of synergy effects between the chemical companies and providers of logistics services. The Czech Chemical Industry Association took part in the development of the freight transport concept in the interests of improving the competitiveness of the local chemical industry. Meanwhile, a chemical company from Poland is planning a CT transport operation to central Spain, replacing the road haulage across Europe with multimodal links which begin at the terminals of Gleiwitz or Sławków in southern Poland, with the trip starting by rail to the Baltic seaports of Danzig or Gdingen before continuing by short sea to Bilbao. The journey takes between 23 and 25 days, but the company prefers this option over road haulage because of its considerably lower costs. A chemical company from Italy is currently trying to organise a multimodal transport operation from Milan to Kiev. This transport could serve as a model for additional connections to Eastern Europe. In Hungary, the pharmaceutical company EGIS is working on transferring transport operations from China via the port of Hamburg using a multimodal connection to a terminal in Budapest. The results obtained so far during the intensive discussions with the chemical companies and logistics service providers show the considerable need for support in terms of communication and cooperation as well as the untapped potential for strengthening multimodal transport. The project partners will continue and consolidate their cooperation with the participating businesses until the end of the project in April 2019. After this, the support structures which have been established should then be maintained by the chemical associations and clusters that are involved. 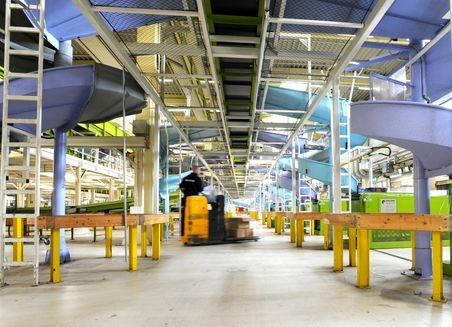 The dispatch centre of Hermes Fulfilment in Haldensleben houses the world’s biggest automatic returns warehouse. And 3,000 employees handle 16,000 parts every hour. At the Haldensleben dispatch centre, a daily total of up to 40,000 boxes is delivered from all over the world. Up to 1.2 million boxes with goods are stored in the 30-metre high-bay warehouse in 61 aisles. If placed in a row, they would make a 600 kilometre long line of parcels. In the automatic returns warehouse, there is space for a million items in 30 lanes on 28 levels. The world’s biggest shuttle system with 840 shuttles can put up to 2,000 returns containers into or out of store per hour. Up to 300,000 shipments are packed, loaded, and delivered to end customers throughout Europe every day.